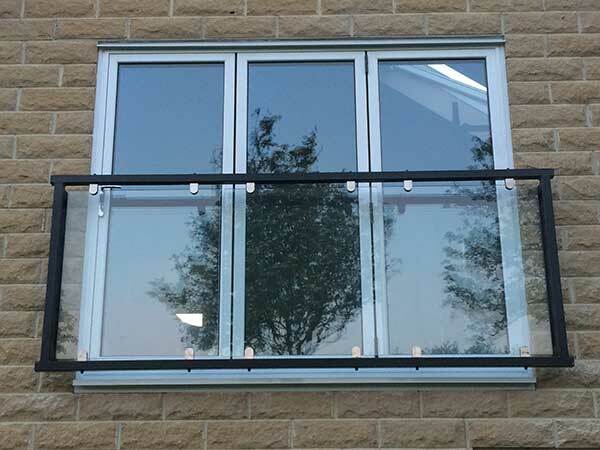 Stylish Glass Juliet balcony in any size. Delivery in 2 days. Our latest design of glass juliette balcony, the stylish Franklyn requires no side braces. It is made from 10mm toughened glass, with 50mm tubular 316 marine grade stainless steel. Clear glass is standard, or sand-blasted frosted/opaque privacy glass option (as in the photo below) is available for an additional £25 per metre. We keep glass in stock so can build and deliver Franklyn balconies in as little as 2 days. It is delivered to your door, ready to be fitted. Designed for easy fitting by a builder or experienced DIYer. We can supply the exact size you require, up to 3.5 metres wide. When ordering you can specify any length of stand-offs (connecting the balcony to the wall bracket) you require. For example you may want longer stand-offs if the brackets are to be fitted under tiles or insulation. Clear glass is standard, or sand-blasted frosted/opaque privacy glass option is available for an additional £25 per metre. Unlike most of our competitors, there are no other charges. All prices include VAT, fixtures and fittings, bolt covers, etc. All major cards accepted – no extra charge for credit card payments.